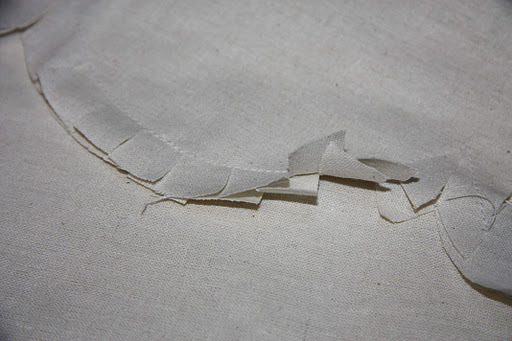 This post just wouldn’t be complete without a dodgy toile/muslin photo! So here is my completed Meringue toile, right on time as per the sewalong’s schedule. I cut an 8 at the waist and a 6 from the hips down, and it fit like a charm. No fitting adjustments required! 1. 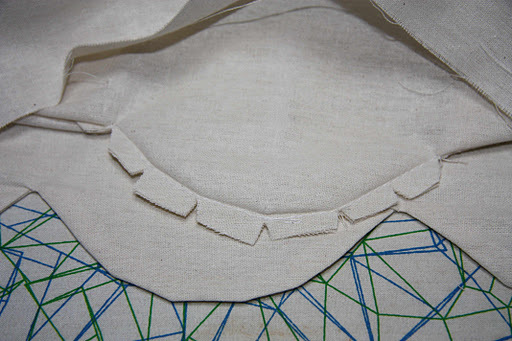 Before clipping, ‘set’ the seams by pushing your iron inside the scallop and pressing over the scallop seam. 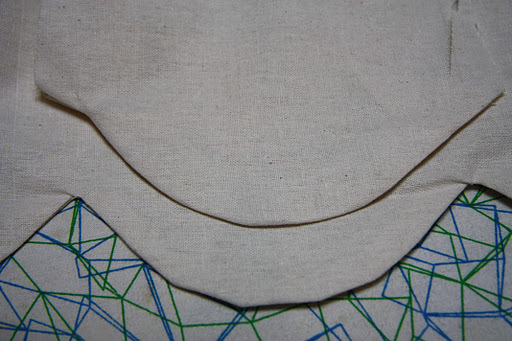 I did this twice – once for each fabric side of the scallop. 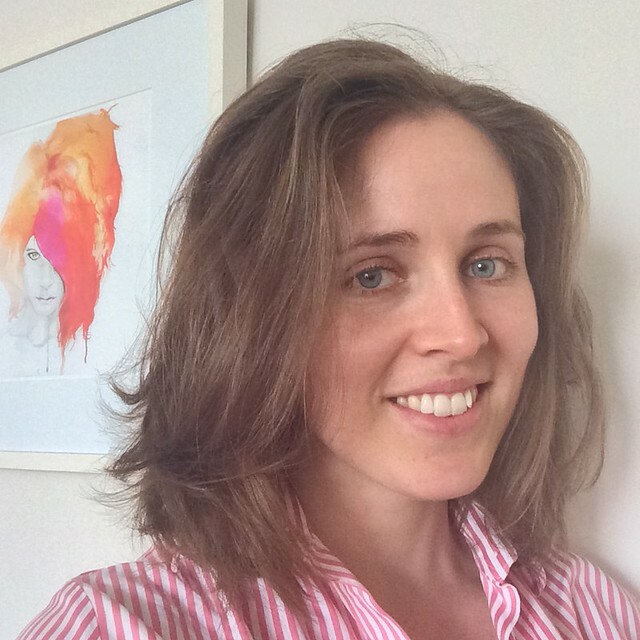 (I rushed ahead and clipped before I should have though…naughty). Doing this before clipping apparently strengthens the curve, whilst clipping it does weaken the seam to some degree. Having the form already ‘set’ will also help to give a smooth curved shape. I’m going to add a waistband (which will be in the lilac linen for contrast), and I’m making it a two-tiered affair – with the scallops just above the half-way mark, and the skirt ending just above the knee. I’ll have to change the width of the scallops anyway so they fit in with the cutout pattern on the cream linen, and do some fancy pattern matching to get a nice even look about the skirt. I’m going to nickname it the Pavlova – which is an Australian/New Zealand dessert, with a meringue base and a cream/fruit topping. 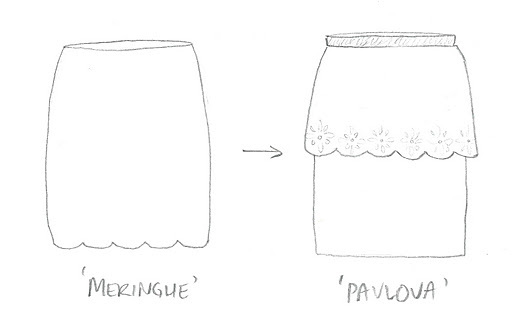 So as the Pavlova dessert is like the Meringue + cream and fruit, so this skirt is the next iteration of its parent. Smart, eh? I basically have two Meringue skirts here, I’ve kept the scalloped part and raised it up, taking in the side seams so they match the circumference at the waist and look relatively non-poufy. The one underneath just has a straight hem and I’ve tapered it slightly (ok, majorly) to be a little straighter. 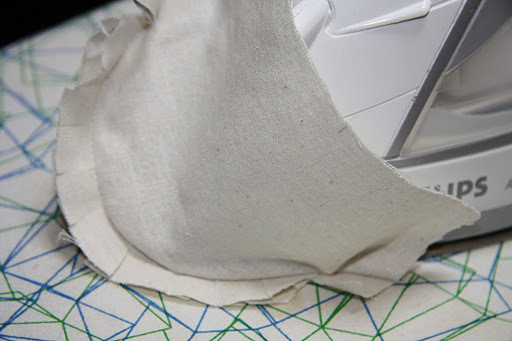 I remembered the Coletterie Blog did a tutorial on making a waistband for their Meringue a while back which I followed too. 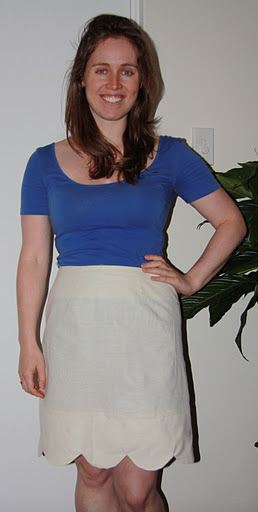 When I make this in my actual fabric though – I’m going to need to change the scallop design. Colette’s scallop has a frequency of 12cm (the length of the pattern repeat) whilst the cutout pattern on my linen has a repeat of 11.2cm. You wouldn’t think 8mm would make much of a difference, but it does! Oh I love the pavlova idea it is a great way to balance the scallops! I too just made a scalloped hem dress (haven't taken photos yet) and I feel like I look a little cartoonish. Your pavlova version looks really stylish without looking silly! Great idea, well done! Thanks Julia :) I saw a gorgeous dress the other day with a scalloped V-neck, so I'm looking forward to seeing what you've done! I absolutely love the Pavlova! I haven't tried the Meringue, because I was nervous about how the scallops would look on me, but the idea of a scalloped peplum instead is genius. I can't wait to see it in your chosen fabric! I am so happy I read this before I got started with my fabric. I will definitely be following your tips. I love your new skirt idea. Maybe you could do a see along with your new pattern? Thanks for the tutorial and I love your idea. The half Pavlova is adorable! I love, love, love this idea! The peplum really balances the skirt out and is adorable. I agree with the others that there's a lot of potential for mixed prints and mixed textures. Fantastic idea! I wasnt to happy with the Meringue on me either :) But am super pleased with this version. Glad you like it! Glad to be of help :) maybe! We'll see! Indeed! Nice skirt :) what have you the idea? What a brilliant idea, I love this version. I am still fiddling with getting the pattern sized and sorted so havent got as far as my muslin, but I too intend to add the waist band so it sits better. Thanks for the tutorial on the scallops. Really super cute! I like the Meringue, but I feel like I would look like a little kid in it– this is a perfect balance of fun and grown-up! Great job! Oh, how cute! I love the idea of the Pavlova, both in concept and in name.Your muslin looks so good! Thank you for the tips on turning the scallops. I was contemplating making everything more complicated by using a cardboard scallop template to iron around, but you managed to get the scallops formed beautifully just with your clever tips. Thank you for sharing! great variation! reminds me of the burda style handbook skirt (which i am obsessed with right now) with a fabulous extra bit of flair. thanks for sharing this great idea!! Thank you so much for help with the scallops. I wish I had read this before I sewed! I actually lengthened the whole skirt four inches and it looks much better than showing my puffy knees!